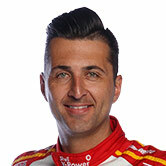 Fabian Coulthard insists his bid for a maiden Virgin Australia Supercars Championship isn’t over, despite losing more ground with his Pukekohe rollover. 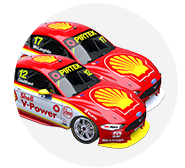 The Shell V-Power Racing driver started Race 23 of the season as Jamie Whincup’s closest challenger, 17 points behind, but ended it with a damaged Falcon and 137 adrift. Coulthard went off the road backwards and rolled after tangling with David Reynolds between Turns 9 and 10, as Reynolds recovered from being forced wide by Chaz Mostert. Having started the preceding Gold Coast 600 event with a 91-point lead, Coulthard has now also fallen behind team-mate Scott McLaughlin, who is 18 points adrift of Whincup. Asked by Supercars.com about his title hopes, with 450 points on the line from the remaining three races, Coulthard said: “It’s not over. “We’ve got tomorrow, if we can get it fixed, and we’ve got Newcastle. Coulthard started the race in seventh place, but relinquished track position with a long fill at his first pitstop. Having started his second stint near the base of the top 20, the New Zealander recovered to run ninth before the carnage unfolded. Mostert has accepted the blame for the situation, while Coulthard feels Reynolds “wasn’t really there” on his right-hand side to have to look out for while trying to capitalise. “I managed to get up to 10th and I was battling with Chaz, Reynolds, [Tim] Sladey and basically Chaz and Reynolds have come together,” Coulthard said. “Chaz knew he’d put himself in a position where he knew he’d need to redress, slowed everybody up, basically me being a racer has seen two easy passing opportunities and went for it. Coulthard’s Shell Ford went backwards through the gravel trap, and bounced up from the tyre wall, landing on his roof, an outcome he says he didn’t expect. “I didn’t think for a second that I was going to end up on my roof,” he said. “I think [after hitting] the tyres, it’s gone up and rolled over.